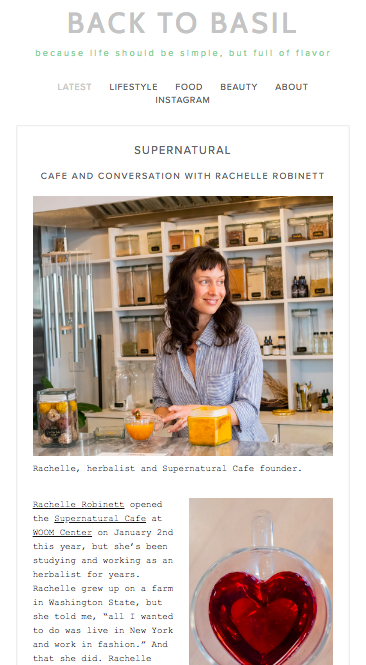 Rachelle Robinett opened the Supernatural Cafe at WOOM Center on January 2nd this year, but she’s been studying and working as an herbalist for years. Rachelle grew up on a farm in Washington State, but she told me, “all I wanted to do was live in New York and work in fashion.” And that she did. Rachelle worked in advertising for fashion clients, and also did some modeling before eventually transitioning into the world of wellness as a full-time career. I asked her what the tipping point was for her to make the jump, and she says while friends had been encouraging her for a while, she credits one woman with giving the final push. The woman, who is now a friend, works at Estee Lauder. Rachelle explains, “I was in a meeting there presenting some advertising strategy and she interrupted me” asking, “could you please tell me what your skincare routine is?” Yes, you read that correctly: a meeting with one of the largest cosmetic & skincare brands and conglomerates in the world. Rachelle was caught totally off guard in the middle of a presentation, and started explaining that she drinks a lot of green juice and water, but the woman - whom she had never met, mind you - kept wanting to know more. After the meeting she pulled Rachelle aside to tell her that the information she had and the way she communicated was really special, and that she should really consider sharing it with a greater audience. So Rachelle started a blog and things grew organically from there. Today Rachelle works individually with numerous clients to tackle their concerns on an individual basis. Her approach is very personalized for everyone, but she says she usually starts with food. She’ll even go grocery shopping with clients when needed. One of the most refreshing things about Rachelle is her down-to-earth, no frills approach to wellness. In the last few years the wellness movement has really taken off, and some days it feels like we’re being told we should buy ten different powders and try a variety of expensive treatments. Not only will that burn a hole in your pocket, but it’s often unnecessary. She says, “if we can fix a symptom with a food, we’ll use a food.” And that “diet is first...good quality food, good quality water, good sleep, good exercise - then herbs,” starting “with the weakest stuff first.” If you want simple, honest advice (there’s a lot of misinformation out there!) to improve your health, Rachelle’s your girl. If you want a delicious plant-based, non-dairy medicinal mylk, Rachelle’s your girl. If you want to hang out at a cool cafe, inside a very special yoga studio, and talk to a total babe of an herbalist - you guessed it, Rachelle’s your girl. You can visit Supernatural at the WOOM Center at 274 Bowery, 2nd Fl. ASHLEY: I was first introduced to the Supernatural Cafe when I sampled an elixir after a WOOM class (and it was delicious!). How did the idea to open a cafe inside WOOM Center come to you? Did you practice yoga there regularly beforehand? RACHELLE: So glad you liked the elixir! Making mixes for the yoga guests there is a great perk of being in a place with such a lovely community. Supernatural coming to be there was really organic and spontaneous even. After a practice there, the owners and I got to talking about my taking over the area that became the apothecary/cafe. We co-hosted a dinner together (they cooked and I taught about food as medicine) and the rest is (recent) history. I love mixing my own potions at home and have fun combining different ingredients. Are there any adaptogens or herbs that you don’t recommend combining? Do any counteract each other in your opinion? The beauty of plant medicine is that it's generally safe, though not always and not for everyone. It's always wise to read up a bit on any herbs you're using and usually to ensure that they don't interact with medications, or that they won't keep you up at night when you're trying to sleep because they're stimulating, for example! Otherwise, mix away. With summer around the corner I wanted to ask if you have any herbal topical or ingestible solutions to ease redness from either sunburn, heat rash, or insect bites? Internally, nettle (probably my favorite herb) is a wonderful antihistamine. Great for allergy season, or if you get a rash of bites, say. Topically, arnica and aloe are great. Comfrey and camphor and mints are soothing (though can be too sharp if you're sunburned). Coconut, shea, and jojoba are excellent moisturizers. (I haven't used lotion in years!) Witch hazel is also a great toner. I make simple essential-oil infused witch hazel-based mists and use them all day long in the summer, especially after a run or lots of sun. Verte Essentials' is also beautiful. What are some of your favorite in-season plants to eat in the summer? Fruit! Anything local. Lots of spring and summer greens. Lighter, softer things usually. And herbs that are food-medicine too, like nettle. And always mushrooms. In addition to WOOM Center, what are some of your other favorite NYC spots for self-care and yoga? Do you plan to expand the Supernatural Cafe to other locations in the future?! If that's what the people want, then: yes! For more photos and the seasonal Supernatural menu, see the original story at Back to Basil.